A locked room, a corpse. This time, everything in the room is reversed, including the dead man’s clothing. International queries fail in identifying the victim. The icing on the cake: the victim or the murderer ate a tangerine before the bloody act. Oh, and let us not forget the two spears shoved inside the length of the victim’s reversed clothing. Other concerns fill the tale: messy love affairs, the “reversed” written Chinese and Hebrew languages, and no surprise at this point in Lee and Dannay’s career, obsessive philately. The Challenge to the Reader reappears in this novel (it had been missing in The Siamese Twin Mystery). 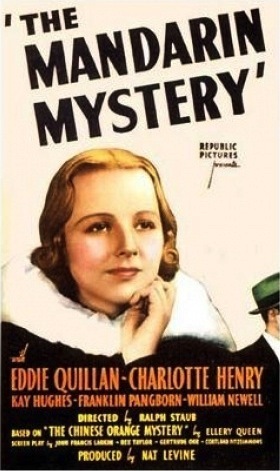 The title still contains a nationality followed by a noun, Inspector Queen and his squad, along with “houseboy” Djuna, are all present and accounted for. 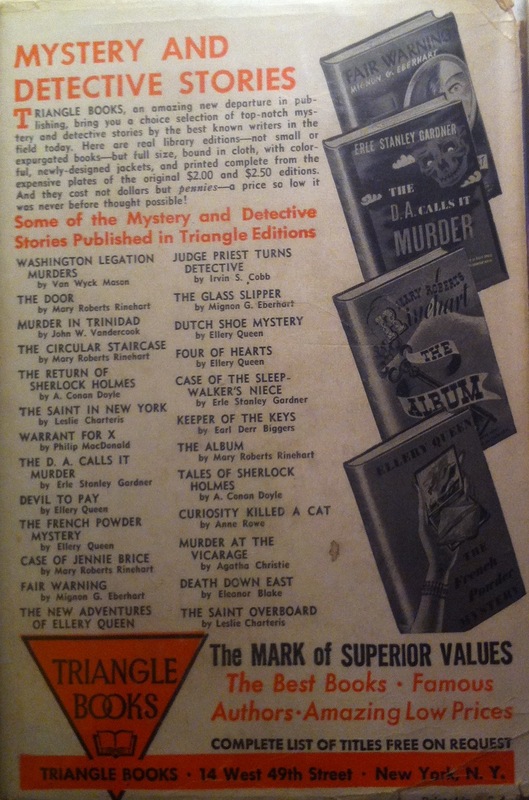 This mystery contains all the hallmarks which combine into the Ellery Queen formula from this early era. Soon, this era of Queen’s novels will come to an ends, and more interesting novels, movies, radio and television shows, and comic books will follow. This is an opportune time to reflect, with eighty years hindsight, on this flawed yet essential period of Ellery Queen’s career. Of course Ellery doesn’t want to tell his father anything yet. He needs to develop more drama, with a larger audience. But at least his father can now show, after five years of novels, that he knows, and is not surprised by, his son’s idiosyncrasies. The cousins have been writing long enough now, to relax into enjoying their characters. As they do, the novels become more entertaining, more enjoyable. 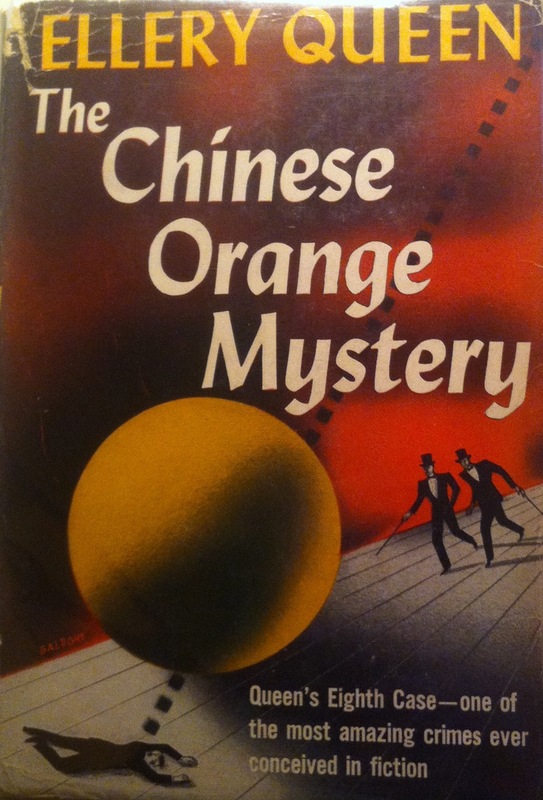 As to the title change: not to spoil the novel’s punchline, but, rest assured, there was a specific reason the novel was called Chinese Orange, as opposed to Mandarin Orange or Tangerine or Mineola Tangelo. The movie cuts out that central, essential element. The movie does have a locked room, a corpse, and philately, but little else in common with the novel. 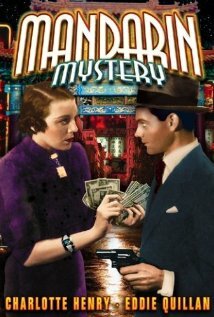 It ran 66 minutes, and isn’t the greatest detective flik of all time, or even close to it. If you must watch it, you can do so (with an abbreviated version) here! This one is short on logic but long on brilliance, imagination, and visual details. It would make a good film or a 75-minute TV episode, since so much of the explanation by Ellery is via demonstration rather than speech. Also, the 3rd example of a “Eureka” moment in the novels.